Newly discovered canine population has unique genes that may have been lost to the captive breeding population. 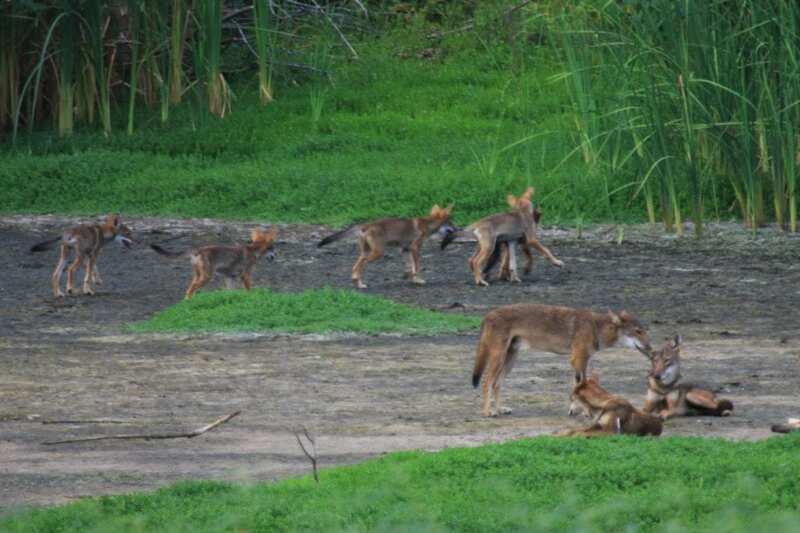 Though red wolves were declared extinct in the wild by 1980, a team of biologists has found their DNA in a group of canines living on Galveston Island off the coast of Texas. “This is a remarkable finding, as red wolves were declared extinct in this region over 35 years ago and remain critically endangered,” said Elizabeth Heppenheimer, a graduate student in the lab of Bridgett vonHoldt, an assistant professor of ecology and evolutionary biology at Princeton. “While there have been reports of ‘red wolves’ along the Gulf Coast, conventional science dismissed them as misidentified coyotes. Now, we have shown that at least one example of a ‘red wolf sighting’ has some validity to it, as these Galveston Island animals definitely carry genes that are present in the captive red wolf population yet absent from coyotes and gray wolf populations.” Their work appears in the special issue “Conservation Genetics and Genomics” of the journal Genes. Prior to this, the only known living red wolves (Canis rufus) were a reintroduced group in North Carolina. The small wolves — larger than coyotes but smaller than the better-known gray wolves — once lived throughout the southeastern United States, but by the 1970s, they were facing extinction. To save the species, the last known red wolves were trapped for a captive breeding program. They had already begun interbreeding with coyotes, so of the 240 canines captured, only 17 were deemed 100 percent wolf. Of those, 14 successfully reproduced, and by 1990, a population of red wolves had been successfully reintroduced to North Carolina. The success of the red wolf recovery program led to other wolf re-introductions, including gray wolves (C. lupus) in the Yellowstone National Park region and the ongoing restoration efforts for the Mexican wolves (C. lupus baileyi) in the southwest. Though initially successful ecologically, the red wolf population now has fewer than 40 surviving members, leaving them once again on the brink of extinction in the wild. This study traces its origins to wildlife biologist Ron Wooten, who had been observing a population of canines on Galveston Island. He emailed vonHoldt’s lab asking for genetic testing of two road-killed animals. Once the researchers extracted and processed the DNA, they compared the samples to each of the legally recognized wild species of the genus Canis that occur in North America. They used samples from 29 coyotes from Alabama, Louisiana, Oklahoma and Texas; 10 gray wolves from Yellowstone National Park; 10 eastern wolves (C. lycaon) from Algonquin Provincial Park in Ontario; and 11 red wolves from the red wolf captive breeding program. Because they can interbreed, coyotes and red wolves confound the most commonly recognized definition of “species,” meaning a group whose individuals can breed and produce viable offspring. But as that definition doesn’t account for organisms that reproduce asexually, like bacteria, biologists recognize many other definitions of species as well, said Heppenheimer. “Coyotes and wolves are considered distinct species based on the ‘ecological species’ concept, which recognizes wildlife as different species if they use different resources within their environments,” she said. Wolves and coyotes prefer to breed with members of their own species, so hybridization occurs only under very specific ecological conditions, such as when population densities are so low that the animals are forced to choose between interbreeding and forgoing breeding altogether. Some recent studies have also found that disrupting a mated pair also increases the chances of hybridization. Probably because of this interbreeding, the Galveston Island canines are “ambiguous-looking,” Heppenheimer acknowledged. “Even to a trained eye, coyotes and wolves can be notoriously difficult to tell apart from a distance or in a photograph without scale. That said, the more time spent looking at these animals, the more you begin to recognize subtle differences in snout shape or ear size.” The official species markers depend on precise measurements, such as hind foot length and head width, which the researchers didn’t have access to, since they were using photographs and small samples taken from road kill. “It’s hard to put my finger on exactly what about these animals made them look ambiguous, since we didn’t take any quantitative measurements, but the snout shape and the overall size of the animals just didn’t look quite right for them to be pure coyote,” Heppenheimer said. “Texas may be an appropriate location for future reintroduction efforts,” said Heppenheimer. If the reintroduced wolves breed with local coyotes, as has already begun happening again in North Carolina, it may have an unexpected benefit, she said. “If hybridization does occur, the ‘coyotes’ in the area may carry red wolf genes, and these hybridization events could restore red wolf genes that were lost as a result of the captive breeding program.” More research will be needed before this is done, she added. In addition to Heppenheimer and vonHoldt, the research team included Kristin Brzeski, a former postdoctoral researcher in vonHoldt’s lab who is now an assistant professor at Michigan Technological University; Wooten, the wildlife biologist who provided the samples; William Waddell of Point Defiance Zoo in Tacoma, Washington; Linda Rutledge of Trent University in Ontario, Canada; Michael Chamberlain and Joseph Hinton from the University of Georgia, Athens; and Daniel Stahler of Yellowstone National Park. “Rediscovery of Red Wolf Ghost Alleles in a Canid Population Along the American Gulf Coast” by Elizabeth Heppenheimer, Kristin Brzeski, Ron Wooten, William Waddell, Linda Rutledge, Michael Chamberlain, Daniel Stahler, Joseph Hinton and Bridgett vonHoldt was published Dec. 10 in the “Conservation Genetics and Genomics” special issue of the journal Genes (DOI: 10.3390/genes9120618). Their work was supported by the Point Defiance Zoo and Aquarium’s Holly Reed Conservation Fund, the National Science Foundation (grants PRFB-1523859 and DEB-1245373), the Natural Sciences and Engineering Research Council of Canada’s Ontario Ministry of Natural Resources and Forestry, and Yellowstone Forever.